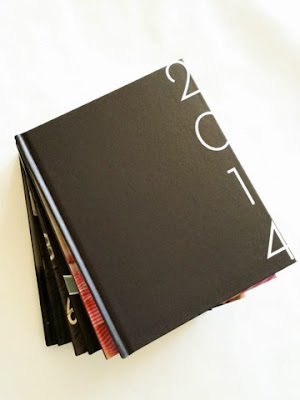 Checking off a personal to-do, our 2014 year in review photo book is here. It's one of those things I push myself to get done by February because I know if I wait, I'll be tempted by good weather and it will fall the wayside. Starting with travel books in 2009, 2010 and 2011, it then morphed into more of a year in review in 2012. Last year's book was supplanted by an baby's first year book since that made the most sense. Now back to a year in review style. I love having the years most important photos in physical form. Once again I used Blurb to make my annual book - mostly because I've used them so many years now and I want the book to be the same size. Up until now I've been really pleased with the company but this year was a little bit disappointing. The book is still a good quality piece at a reasonable price but they made two changes this year I wasn't crazy about. First they changed the software which made it much more annoying to line up photos correctly. Since I use a lot of collage layouts that was a lot of spot checking and editing to get it right. Second, they changed the size slightly so now its a tiny bit longer which means the books don't line up perfectly anymore. A small annoyance but I might just look for another supplier next year. Any suggestions? That is the cutest baby. Your trips are so fabulous...and with a baby! So cute, my goal is to go back and do these for our family too. Here's hoping. I've heard great things about MyPublisher. mypublisher.com. Significantly different book sizes though. Thanks. I used My Publisher years ago but I was really unhappy with the quality. Maybe time to try it again? They've changed a lot over the years - the quality of their large format books are the best I've seen. Those books look great. As you can tell, I have significantly ramped down my layouts just for ease so I'm with you on that. Isn't it fun to see them in hardcopy? I've used a few different photo book sites, but I was super impressed with the quality of Adoramapix. Lots of different sizes and the software is easy to use. Thanks Sarah. I'll check them out. What size book do you use? I do the "standard portrait" size which is a little shy of 8 inches wide by 10 inches high. Love them... Reminds me that I need to get started on this. Do you do pictures only or do you add text too? Most years I don't have any text (except for the month or location) but for Aggies baby book I did a month by month recap of what she was doing, etc. I actually think having some write ups for every year would be nice but I know it would mean never finishing so I just use photos. I print out my blog every year on blurb. That's my year in review. I also make a little video highlights of our most exciting or photo worthy adventures. I love having a record of family life. Ive thought about doing that but I don't know how the format would work. Does blurb let you import the whole thing? This is such a lovely thing to do! I am inspired! Can I just say that Agatha has the sweetest wardrobe? I want her black & white scallop dress. And her furry vest. And the heart dress!! Completely adorable. I used to make yearly photo albums but I think the last one was in 2013. *hangs head in shame*. I need to get on that. I've used Shutterfly in the past but your Blurb books look much better. 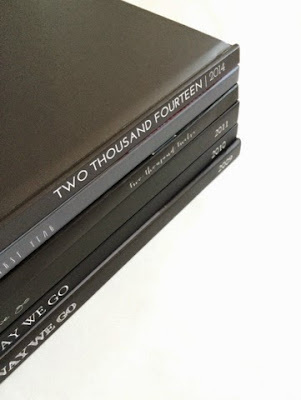 I enjoy your blog and love your photo books!